If you have children you will know it can be very easy to buy toys for little ones as there is so much out there to choose from. Of course this can make buying toys hard as well. That's where Wicked Uncle can help you out, aimed at all the family to give a helping hand when buying toys for little ones. 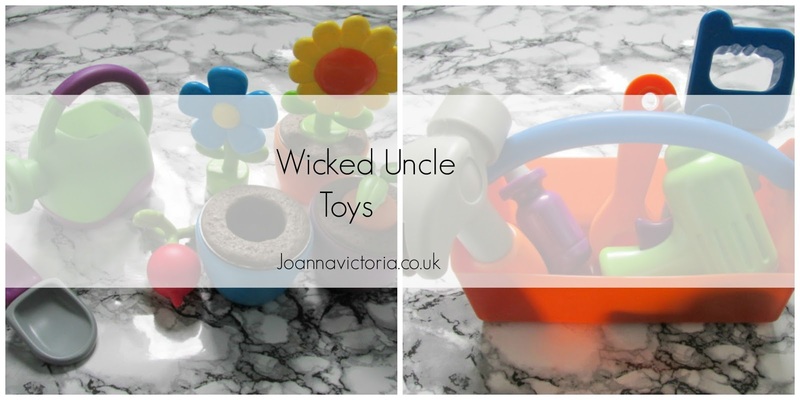 Wicked Uncle have a selection of toys suitable from babies to teens in a range of categories from age range, A-Z, gender and popular toys. This makes finding the ideal gift much more easier. As Blake is 18 months in a few weeks, I decided it would be a good idea to choose toys suitable for 2 years +. Then he will still be able to play with them next year. My first choice was the Grow it: My very own garden set. This is great for imaginative role play and is bright and colorful making it eye catching. The set comes with 9 chunky pieces great for small hands. Another fab thing about the set is that the watering can is like a proper one, so that children can also practice watering real plants as well as the toy ones. The set is made from durable soft plastic which can be easily washed. Blake loves trying to use the watering can, planting the carrot, radish and two flowers using the shovel with the three colorful pots. I also chose the Fix it: My very own tool box from the same brand, which is also great for imaginative and creative play. Again the set is made from soft and durable plastic with eye catching colors making it a fun and stimulating toy. The chunky six piece set contains a realistic sounding drill, hammer, screwdriver, saw and wrench as well as a tool box to keep it all in. It's great for little ones who love to fix things. Blake loves using the drill but doesn't seem to have much interest yet in playing with the other tools (unless you count throwing them at me). I've been encouraging him buy "showing" him how each tool works, I think as he gets older he will certainly start to gain interest. which i feel is a great price for toys that are of such high quality and fun to play with. What do you think of my choices? Have you purchased anything from Wicked Uncle? Lovely choices! That garden set looks great. These are fab, I've never heard of Wicked Uncle before. The little gardening set is so cute! These look so great - the gardening set it SO cute! These toys are great as they are very colorful to attract children. Wicked Uncle is new to me but I'm loving it. Loads of stuff there for my wee ones. Cheers for the heads up! I have heard great things about the Wicked Uncle site and it is meant to be fantastic! The little gardening set looks great.